Race Tech is here to support you in doing quality Suspension & Engine work. However, if you would like us to do the work we have a top level Service Department ready to help. Your bike can only ride to its full potential with the proper blend of Rake, Trail, Swingarm Angle, Wheelbase, and Alignment! All bikes can benefit from the MEGA-M.A.X. alignment and geometry setup! Contact Race Tech to set up your appointment to have your bike properly set up and aligned. Call 951.279.6655 or Email Service. Race Tech Service Department offers same day service by appointment only. If you need your bike in a day, we can do it. Call 951.279.6655 to schedule your appointment today! - And more ! ! ! ! ! 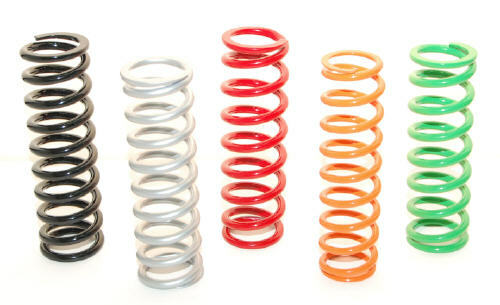 Shock Spring Fitment - Do you have a shock that needs a spring fit to it? Fill out this PDF form and email it or give us a call at 951-279-6655. Race Tech is the place for ATV suspension. Whether you want to modify the stock units or have custom built shocks. Race Tech offers shock shaft rechroming. If you have a scratched or pitted shock shaft we may be able to save you from buying a new shaft assembly. Make your Vintage or Custom Motorcycle Drum Brakes Work!